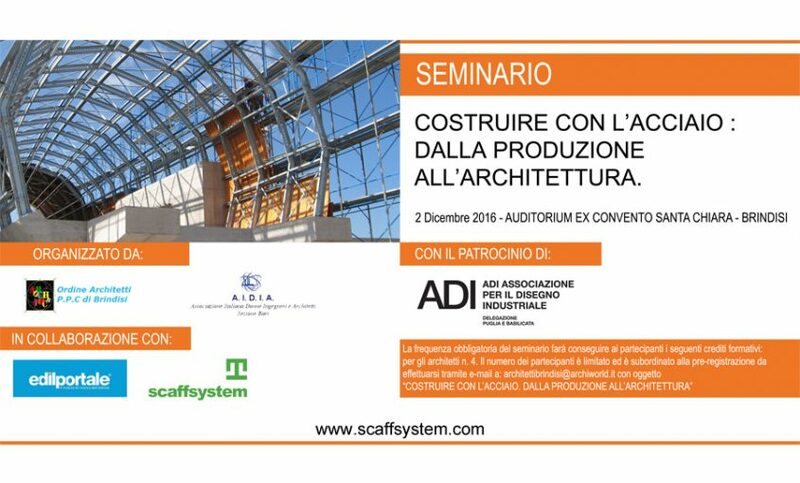 Scaff System repeats the workshop “Building with steel: from production to architecture” in Brindisi. Scaff System is pleased to invite you to the second edition of the event “Building with steel: from production to architecture”, organized in Brindisi in cooperation with the Association of Architects and the Italian Association of Industrial Design. Join us next 2 December at 2:30pm at the Auditorium of ex Convento Santa Chiara to explore the subject of using steel in architectural design and green-building sectors. Architects who will participate in the event will earn training credits counting in their continued professional development. Email us at info@scaffsystem.com to get additional information.